Coming into the end of the financial year, it's time to look for stocks heavily shorted by traders and hedge funds. Hedge funds often like to lock in profits before the EOFY creates “pops” in the respective companies, and / or simply “clean up” their positions. There were a number of candidates for today’s 5 companies reviewed and we may add to this list over the coming few weeks, especially as we own 2 stocks who have ~10% of their stock short sold i.e. Orocobre (ORE) and Independence Group (IGO). 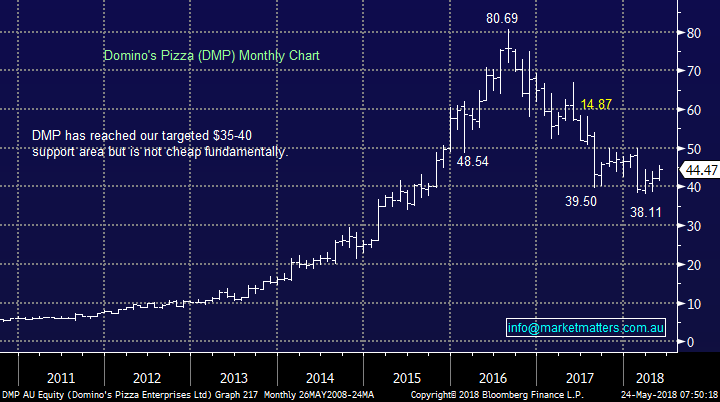 Domino’s (DMP) was also mentioned in yesterdays report as the stock has traded down almost 30% over the last 12-months. DMP has a significant short position of 18.3%, which has been increasing as the stock bounces from its 2018 lows below $40 – makes sense to us. At MM we don’t like DMP as a business / long-term investment but a short squeeze would not surprise us with our potential target around the $50 area. Extremely aggressive traders could consider buying here with stops below $43, solid risk / reward but not a position for MM due to our overall view. Graphite producer Syrah Resources (SYR) is the most shorted stock on the ASX with almost 20% of its stock short-sold although this has decreased 1.5% over the week. The negativity towards SYR appears to stem from scepticism towards the profitability of its Balama project / prices that can be fetched for its graphite. SYR is not a stock we are considering for any medium / long-term investment although its degree of short-interest cannot be ignored. Aggressive traders could consider buying here with stops below $3.30, again solid risk / reward but not a position for MM due to our ambivalence towards SYR. Vocus (VOC) has been a tough story for many Australian investors over recent years, including us. The short-position in VOC sits at 12.1% but well below the 17.5% of last year – the traders have clearly been rewarded and taken their spoils. We all know the reasons behind the dislike of the telco sector as its vied with the Hayne royal commission for real estate in the press – especially when the journalists are in a bearish mood. 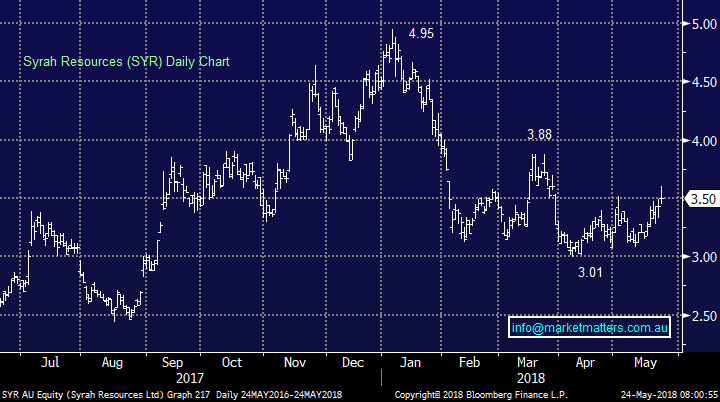 We can see traders covering some more of their VOC position in the weeks ahead as the stock appears to flat lining after being hit with a deluge of bad news. 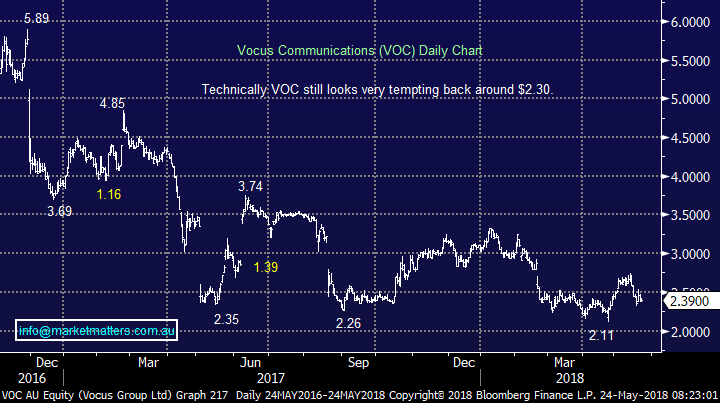 We like VOC as a trade in the $2.30’s targeting a rally to ~$2.90 while running stops below $2.24. However we note that seasonally the best time to buy the Australian telco sector is mid-June, as it bottoms out before the overall market, hence we would not be in a hurry just yet to press the “buy button”. The other risk for VOC is around capital, and whether or not they’ll tap the market. If the stocks rallies from here, we think that would be a strong possibility. APN Outdoors (APO), the outdoor advertising operator currently has 10.3% of its stock short-sold, a figure that’s steadily risen over the last 12-months. APO has new management which in April announced their most recent trading update stating their guidance of single-digit revenue growth was all on track – it appears there are no skeletons in the closet – although outdoor advertising is becoming a more competitive area. The stock’s actually marginally higher for the year and potentially one the hedge fund managers may not want in their short basket for the second half of 2018. The stock’s not cheap trading on a forward PE of 17.2x for 2018 while paying a 3.7% fully franked dividend. 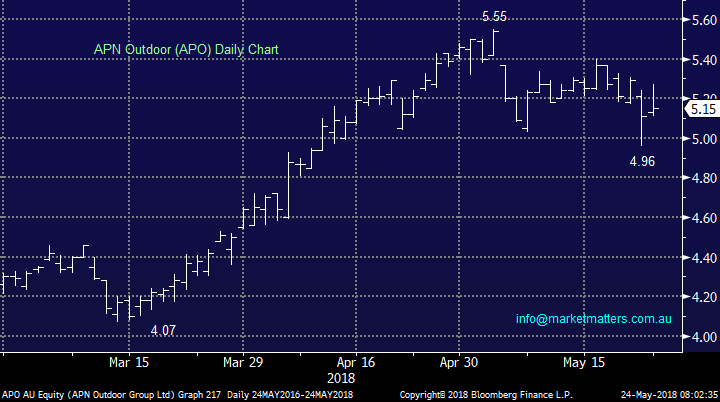 We like APO at current levels targeting over $6 but we would run stops below $4.80 – solid risk / reward. 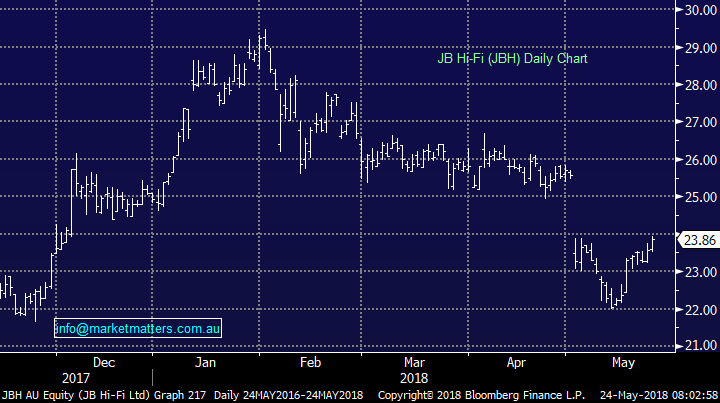 JBH HIFI (JBH) has maintained a short position between 15 and 16% since February. The journey’s been a volatile one for the traders, but a profit guidance downgrade earlier in the month would have settled many of the bears' nerves, however the stock remains up almost 5% over the last 12-months. 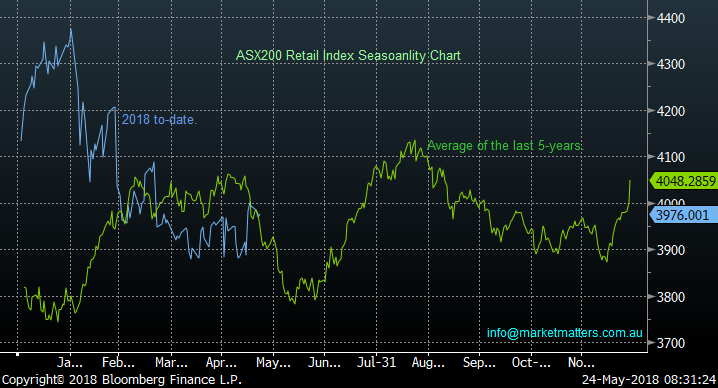 We note that the Australian Retail Index usually recovers very well from around 10-days into June, like the telco’s a touch earlier than the overall index + looking at the trend in the US overnight, consumer discretionary stocks saw some big gains. As we suggested last week, we are watching the retailers closely. JBH is messy from a technical level but we would consider a trading position if it experiences weakness below $22 in the next 2-3 weeks. MM is neutral DMP and SYR. MM likes JBH into weakness below $22 in the next 2-3 weeks. To get our latest market views and hear when we take new positions, trial Market Matters for 14 days at no cost by clicking here.